Snooze in Comfort: Window Travel Pillow | OhGizmo! By Hazel Chua on 05/22/14 • Leave a comment! Touring and checking out new places is fun. The actual traveling part where you ride planes, trains, and buses? Not so much. A lot of people end up with stiff necks and sore muscles after sleeping (or attempting to sleep) upright for a couple of hours. Neck pillows can lessen the discomfort, but only if you lean back. 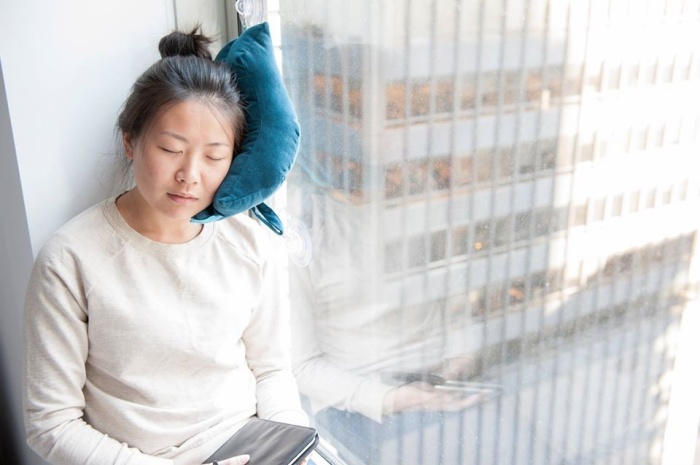 What you’ll need if you want to lean forward or sideways against the window is the aptly-named Window Travel Pillow. It’s essentially a cushy pillow with suction cups so you can stick it right on the window before leaning into it to catch a few Z’s. It’s pretty versatile, since you can just unzip to transform it into a neck pillow. The Window Travel Pillow is available for $29.99.